In case you haven’t noticed, the old bank building by Shudehill station is now an Italian restaurant turning out impressive fresh pasta meals for lunch and dinner and some of the most impressive starter boards around. But it isn’t just the inventive dishes which set it apart from the rest. After all, there are more than 120 Italian eateries and pizzerias in Manchester. It’s not just called The Pasta Factory. 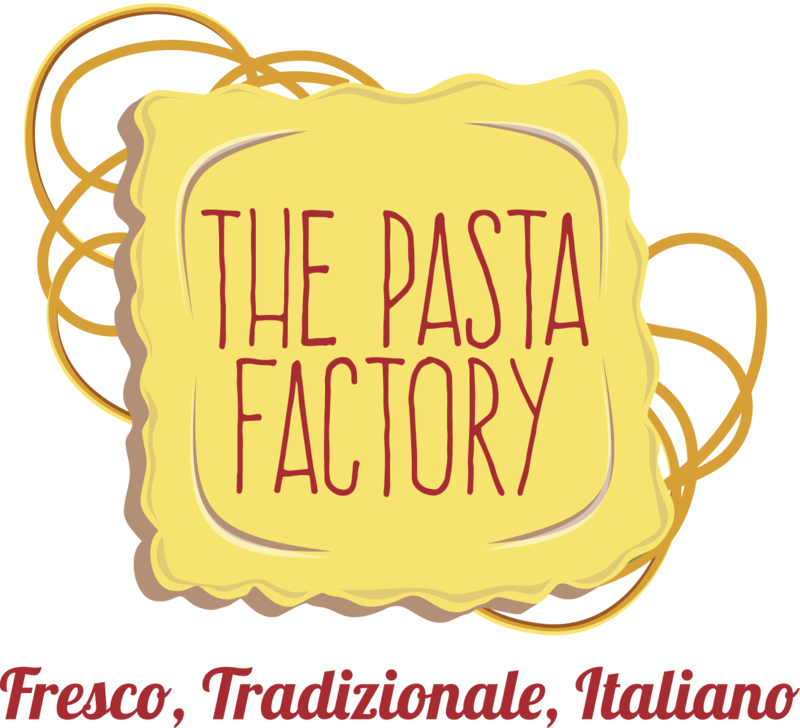 It is a pasta factory – a pastificio – and one of the few places which serve fresh pasta handmade every day using the traditional basic ingredients – flour and water. It was launched by three young Italians – Elisa Cavigliasso, Alberto Umoret and Paolo Guadino, along with operations manager Davide Rinaldi – who grew up in Torino, Italy, went to the same school together, and moved to Manchester about four years ago. “We tried to study the food market – which was really busy already – and we realised that a simple pastificio was lacking,” says Paolo, who is also a sports scientist and fitness coach for Manchester United. 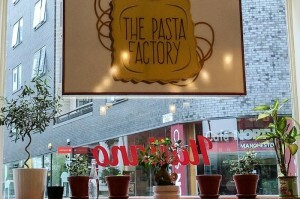 The Pasta Factory is just a stone’s throw from Ancoats, where many Italian immigrants settled in the late 1800s, giving the area the nickname ‘Little Italy’. Many of them opened shops and started their own businesses like making ice cream. 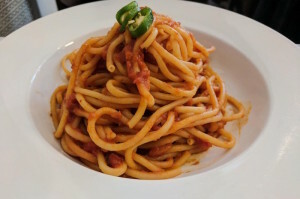 You won’t be surprised to know that Italy consumes the most pasta in the world – a massive 26kg of it per person per year (that’s the weight of an 8 year-old child – yes, we looked it up) – and over 300 types – so you can be sure you are in good hands here. The Pasta Factory day starts around 9 in the morning and ends at about 11.30pm. The restaurant opens to the public at midday. If you thought fusilli and penne pasta were fancy, just wait till you try bucatini (like a thick spaghetti with a hole through the middle), reginette (pasta with a curly edge), and black spaghetti coloured with squid ink. So which is the hardest pasta to make? 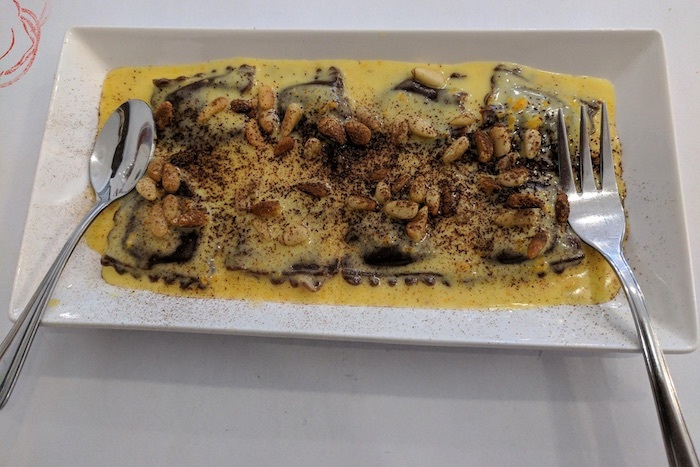 “Ravioli by far,” says Davide, “because the filling needs to be made separately and reach the right temperature, plus two sheets of pasta need to be rolled, filled and divided. Now for some myth-busting. You won’t find any chicken pasta dishes or fettuccine Alfredo on the menu. That’s because they don’t exist in Italy. There’s no garlic bread either. The sticks of garlic bread we love tucking into are most probably borrowed from French cuisine – a baguette brushed with garlic butter. Instead of garlic bread, Davide suggests a close relative originating from Italy – bruschetta, made from garlic grated with tomatoes and served as part of the antipasti. The restaurant offers a taste of authentic Italian cafe culture right in Manchester. A relaxed setting where you are encouraged to sit and take time with your food. There isn’t the frantic feel and sounds of kitchen chaos you may associate with some Italian restaurants. It not only serves up some of the freshest pasta in the city, but is home to a few surprises you most probably have never tried before like homemade vegan parmesan made from nuts, enormous antipasti boards (available with meat, meat-free and gluten-free options) and dessert ravioli with chocolate. 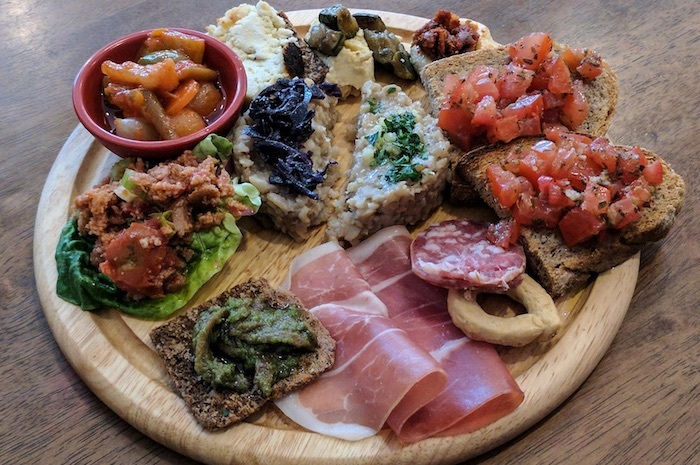 The starter boards are enormous and impressive and contain a number of popular dishes from the Piedmont region, including traditional pickled vegetables plus homemade hummus, preserved courgette and mushroom risotto if you are eating vegan. For the meat-eaters there is a range of cured meats and gluten-free is available too. The mains are equally impressive and the portion sizes massive. Italian food well-suited for northern appetites. 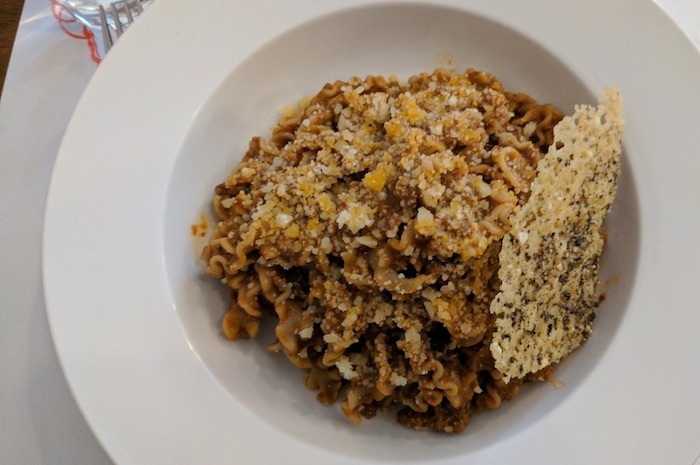 The venison ragu (reginette al barbera con ragu di cervo) is a regular on the menu, based on an Italian family recipe and served with ribbons of red wine pasta and a parmesan crisp. There are lots of vegan and vegetarian options which are equally authentic. Take the highly commended ravioli di funghi in salsa al tartufo – homemade ravioli filled with mushrooms, garlic, parsley and cashews. Many of the dishes on the menu change every month and there’s a surprising number of vegan and vegetarian options – none of them synthetic. They’ve even struck a deal with Unicorn grocery in Chorlton who will be selling their vegan parmesan – a blend of nuts, seeds and seasoning, avoiding that artificial taste which so often taints vegan substitutes. The menu isn’t the biggest – “A small menu is an index of quality and freshness,” says Paolo. Perhaps that’s why the result is some seriously impressive food. All the wines and beers are the authentic Italian stuff, imported and suitable for vegans as the Italian way of fermenting alcohol does not use animal products. “We don’t have any Coca Cola products,” says Paolo. “Instead we have Baladin Cola made in Piedmont. We don’t have Peroni beer, instead we have San Paolo beer from a micro brewery in Torino which exports it to the UK only for us. So if you want to treat that special someone make sure the pasta is fresh. They sell the fresh stuff to take home with you too and dry and hand turn it on site so you can take home the dried version. And if you have any room left, try the chocolate ravioli.